Abigail, The Salem Witch Trials, Nov. 4th 2011. Flyer by Casey Castille. Come see this magical performance entirely produced by local SF events and performance artists. Written by Michael Xavier and Daniel Knop. I have been given the honor (thanks to Michael Xavier and Samantha Ross) of being a featured visual artist in this play. Staring in this show as Abigail is an amazing rock star performer and graphic designer; the multi-talented and beautiful Casey Castille with Daniel Knop as Minister Samuel Parris. Some of the other amazing performers staring in the play, Kurt Brown, Samantha Ross, Nikki Arias, Sandi King, Jay Crawford, Mari Marjamaa and Sean McCall. The next performance is Nov. 4th 2011. My signed Posters and hand-made voodoo dolls will be available for sale at the door. The original painting I made for Abigail is available for Sale for $350.00 Please feel free to contact me or Michael Xavier if you are interested in purchasing the original piece. Don’t miss this amazing show! Thank you and look forward to seeing you there. 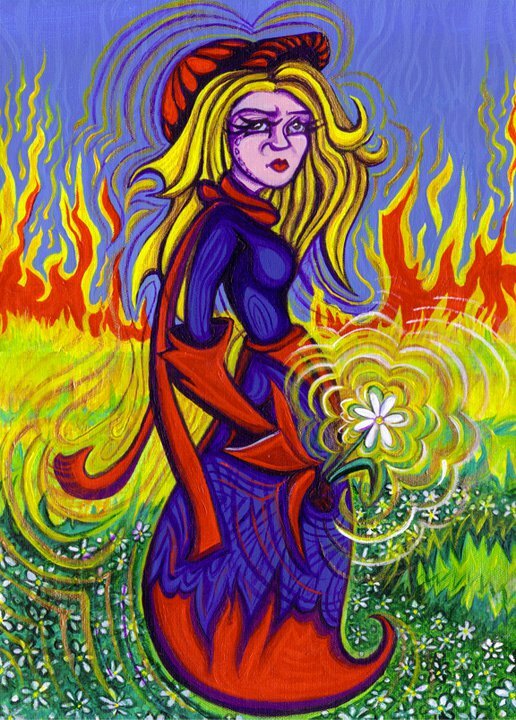 "Abigail" Acrylic Painting by Drea (Andrea Fuenzalida) for Abigail the Salam Witch Trial Rock Opera, 2011. Featured on the show program handed out at the show. This entry was posted on October 25, 2011 at 8:04 pm and is filed under Uncategorized. You can follow any responses to this entry through the RSS 2.0 feed. You can leave a response, or trackback from your own site. Thank you! your website loads really quickly too and I like how you designed it. Cheers!